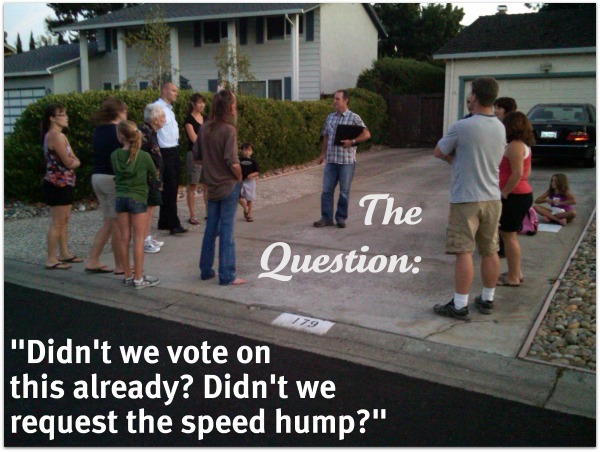 Summer was busy and I managed to miss the end result of the voting done in June over the speed bumps (or humps) and the traffic triangle that was proposed at Harwood and Belwood Gateway. This week I emailed Todd Capurso the Los Gatos Director of Parks & Public Works, and he got me updated in no time. In case any of you neighbors also blinked and missed the upshot, I thought I’d post it here. Todd tells me that “the residents on the block between Harwood and Bacigalupi have requested that I come back and meet with them because some of them do not want the speed-hump that was proposed (and passed) for their block” so there will be some ongoing discussion there about whether to add it or not. Stay tuned! Many thanks to Todd Capurso for updating me on this topic. 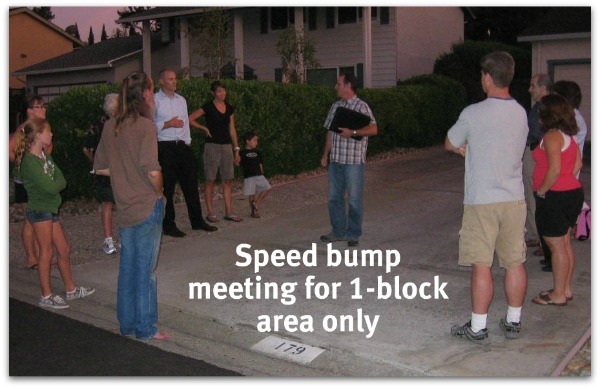 Traffic calming issues on Belwood Gateway which impact neighbors on nearby streets have been the recent conversation in this part of Los Gatos. As a followup to a recent traffic calming meeting meeting, residents on Belwood Gateway, Bacigalupi Drive and others were recently asked to vote on a proposal to block traffic from going through from Belwood Gateway to Almond Blossom. Homeowners on Bacigalupi Drive and Harwood Road are concerned that this would cause a tremendous increase in traffic and speeding, so are trying to prevent it. This has been an eye-opening experience as many of us did not know, until recently, what the procedure was for getting the town’s attention regarding areas with too much speeding. If you live near Belwood Gateway, be sure to attend the traffic calming meeting at the neighborhood cabana on Wednesday, May 11th from 6:30 to 8pm. Be on time as the agenda and discussion periods are chronological and all of it will be relevant to our neighborhood traffic patterns. If you’d like more information, call the Los Gatos Parks and Public Works Department at 408 399-5770.